Every year for a few weeks in late September and early October, our little valley sees an influx of hunters. With their bright orange caps and camouflage vests, they trek out into the aptly-named West Elks Mountains and return with their year’s supply of elk and venison, then swap stories in our tasting room over a glass of hard-earned vino. This dish features just one more of the many bountiful resources of our area, and is best served with our Reserve Merlot and a healthy dose of dramatic storytelling. In a large skillet, cook elk fillets in olive oil until browned on both sides. Set aside. Combine mushrooms and parsley in a small bowl. Set aside. On a lightly floured surface, separate puff pastry sheets and roll into 16-inch squares. Cut each sheet into four 8-inch squares. On each square, place one fillet and 1/8 of the mushroom mixture. Fold the puff pastry over the fillet and press closed, making sure the seam is sealed. Place the pastries seam side down on a rack in a baking pan. Beat egg in a small bowl and brush over tops of pastries. Bake at 350° for 35 minutes. Sauté mushrooms and onions in sausepan until onions are translucent. Sprinkle in flour and mix. Gradually add the broth, wine, tomato paste, and black pepper. Salt to taste. Stirring continuously, bring to a boil and cook for 2 minutes or until desired consistency. 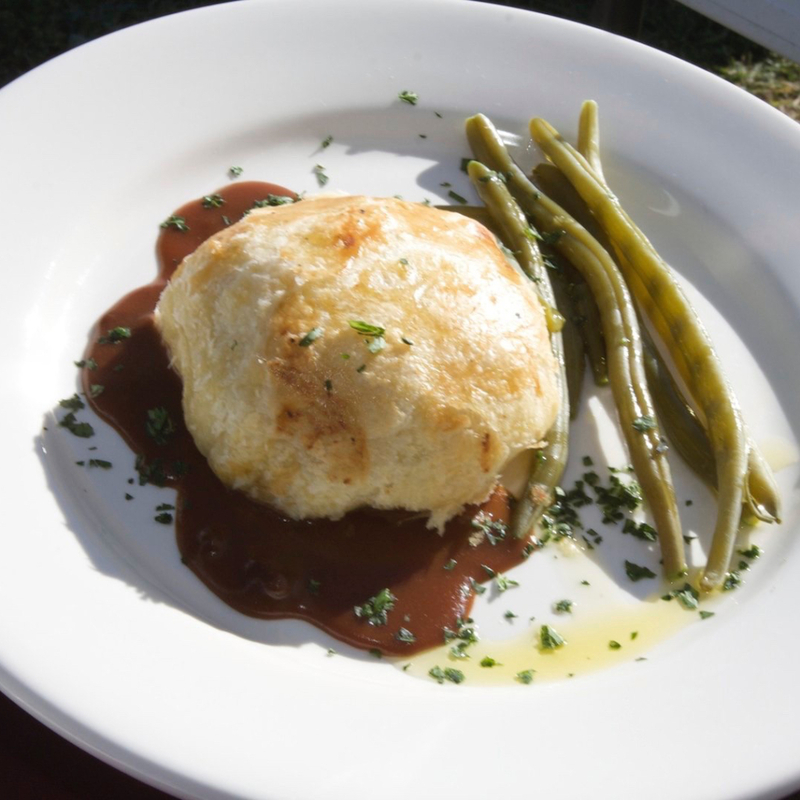 Serve mushroom sauce with Elk pastries and a glass of Stone Cottage Cellars Reserve Merlot.